DALLAS – From Rochester Hills to Canada’s capital. Jonathan Gruden has been selected by the Ottawa Senators at No. 94 overall in the 2018 NHL Draft. A product of USA Hockey’s National Team Development Program, Gruden is a Honeybaked alum and a Miami commit. His dad, John, played for Senators during his own NHL career before becoming a coach that included stops at the NTDP, Flint and now the OHL champion Hamilton Bulldogs. The Rochester Hills native is the son of a coach, and it shows on the ice. Gruden, who finished fourth on the NTDP Under-18 Team in scoring with 28 goals and 32 assists for 60 points in 61 games, may not be the biggest guy on the ice, but does his job in all three zones. 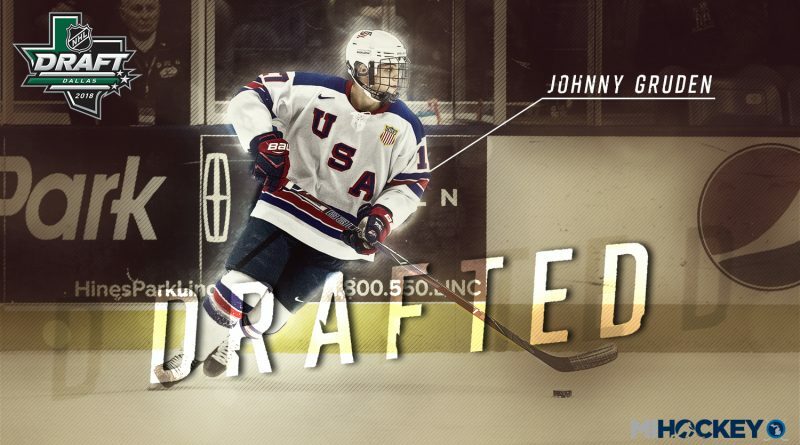 His father, John, coached at the NTDP during the majority of Gruden’s youth, establishing a sense of pride in the national program for the future draftee, and he made his two seasons count. He’s a Miami commit, as well.